Erected by Lima Auto Club. Location. 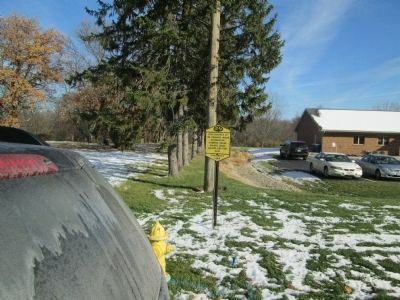 40° 42.062′ N, 84° 9.083′ W. Marker is near Lima, Ohio, in Allen County. 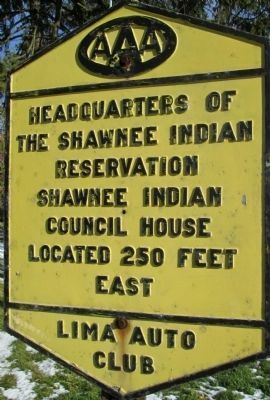 Marker is on Shawnee Road 0.1 miles north of Zimmehly Road, on the right when traveling north. Touch for map. Shawnee Road east side, 400 feet north of Zimmehly Road. Marker is at or near this postal address: 2650 Shawnee Rd, Lima OH 45806, United States of America. Touch for directions. (approx. 2.4 miles away); Solar Refinery (approx. 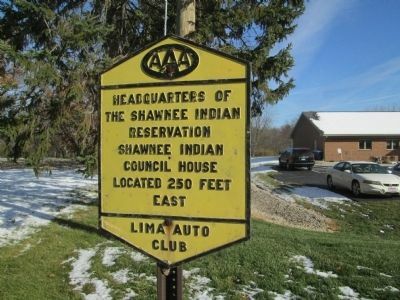 2½ miles away); The Shawnee Indian Reservation (approx. 2.8 miles away). Touch for a list and map of all markers in Lima. More. Search the internet for Shawnee Council House. Credits. This page was last revised on June 16, 2016. This page originally submitted on October 3, 2014, by Rev. Ronald Irick of West Liberty, Ohio. This page has been viewed 574 times since then and 11 times this year. Photos: 1, 2, 3. submitted on October 3, 2014, by Rev. Ronald Irick of West Liberty, Ohio. • Al Wolf was the editor who published this page.